Rwanda’s Renus Uhiriwe Byiza won another gold medal for Rwanda in a sprint 104.4km junior men’s road race finish at the African Continental Road Championships in Ethiopia on Monday. Uhiriwe clocked 2:30:23, beating Eritrean pair of Yoel Asmerom and Yowhannes Gebrihiwet to the line. Another Rwandan Jean Eric Habimana managed a ninth place finish clocking 2:30:29. 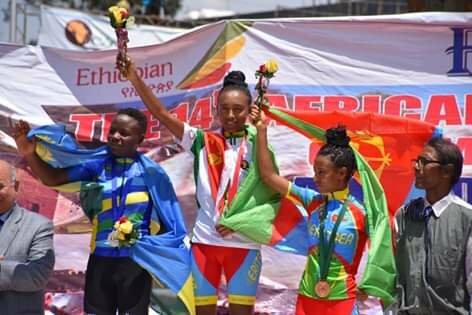 In the women’s 46km category, Ingabire Dianne secured a silver medal following a second-place finish where she clocked 01h22’03 in a sprint finish to come behind the winner Tsegay Danait from Eritrea. 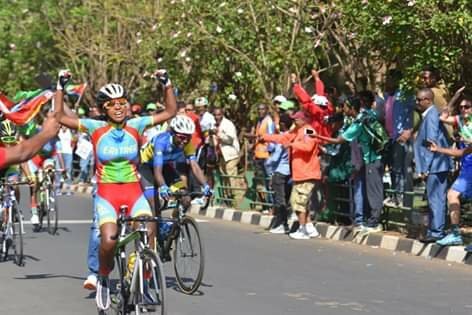 Uhiriwe’s gold medal and Ingabire’s silver medal have taken Rwanda’s tally at the African Continental Road Championships to nine medals (2 gold medals, 3 silver medals and 4 bronze medals). Last Friday, Rwanda secured three medals on the opening day, two silver medals in the U23 and Elite Men’s team time trial and a bronze medal in the junior men’s team time trial. The on Saturday, the elite boys and girls teams won a bronze medal each in the team time trial mixed relay. Then on Sunday, Rwanda’s Mugisha Moise won gold in the 46.6km individual time-trial in the U-23 category while her female counterpart Tuyishimire Jackline secured a bronze medal in the 30km individual time trial race for the U23 category. Action at the 14th African Continental Road Championship winds up on Tuesday with the elite men/women and U23 road race which will cover 160km.